Row Home Eats is on vacation!!! We’re spending a week in New England with the in-laws and the dog. A few months after my husband and I started dating, he brought me to Rockport, Massachusetts for a family vacation. His aunt rented a condo there every summer and I had the opportunity to get to know her and the rest of his family. Fast forward seven years (along with one major haircut, numerous job changes, and a little wedding) and his aunt, sister and brother-in-law live in the area and his parents just bought a vacation property. In fact, we’ll be returning to the area in just over a month to celebrate the marriage of my sister and brother-in-law. I already have an amazing family and have married into one that’s just as great. I feel pretty lucky. With our impending trip to Gloucester, Massachusetts with a side jaunt to Kennebunk, Maine, we knew that we would be indulging in lots of seafood (with an emphasis on chowder and lobster rolls, YUM!) After a picnic lunch on the beach yesterday (sandwiches, fresh peaches, honey roasted peanuts and homemade pickles, of course) we embarked on our journey into town for authentic New England fare. We began at the Bean & Leaf Cafe, a little coffee shop/cafe that happens to employee my sister-in-law as assistant manager. 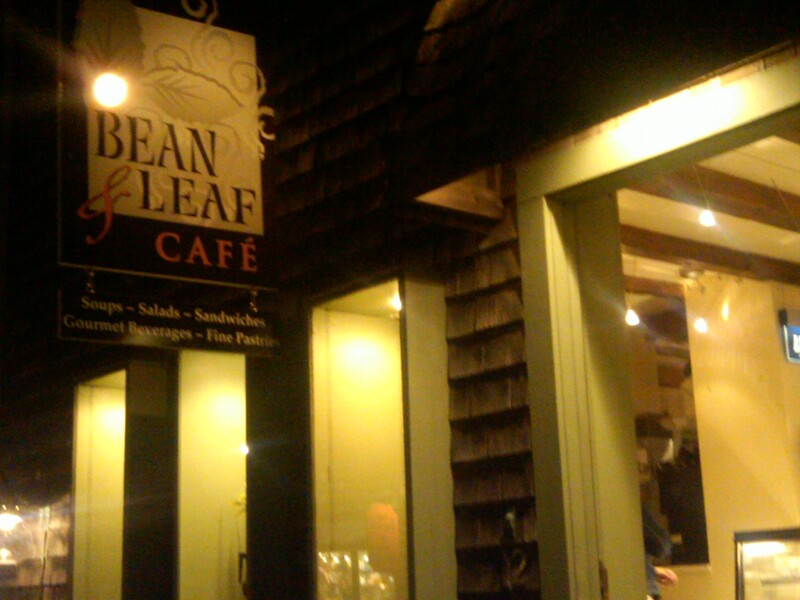 Bean & Leaf is a typical, yet adorable cafe with a phenomenal view of the harbor. I’m kicking myself for missing a picture but I’ll have to get one later. They have an extensive menu of wraps, soups, sweets and beautiful Italian pastries. We opted for the chowder, of course. I must admit that this is my mother-in-law’s chowder. I wanted to get an authentic shot with oyster crackers, but I choose to abstain so I wouldn’t let her eat until I got a picture. 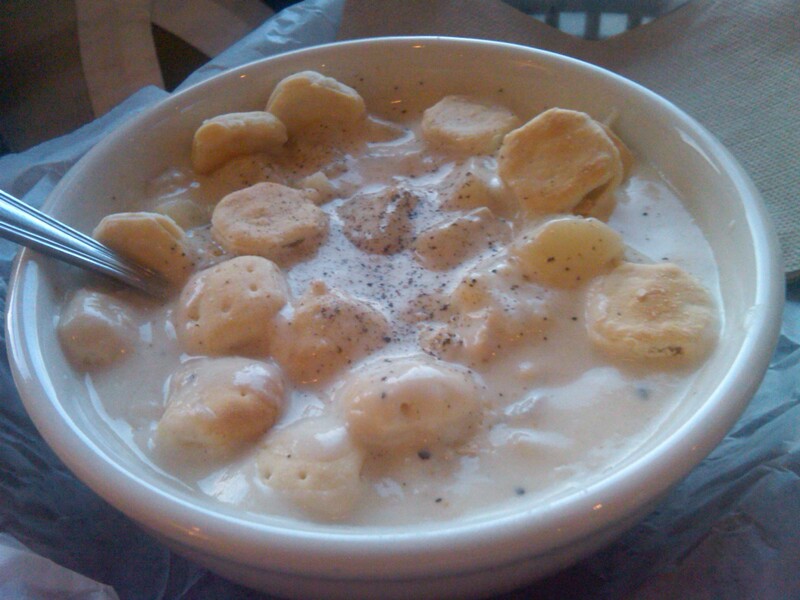 The chowder was warm and creamy with big hunks of potato. It filled me up pretty quickly and I let Jewels finish it off. 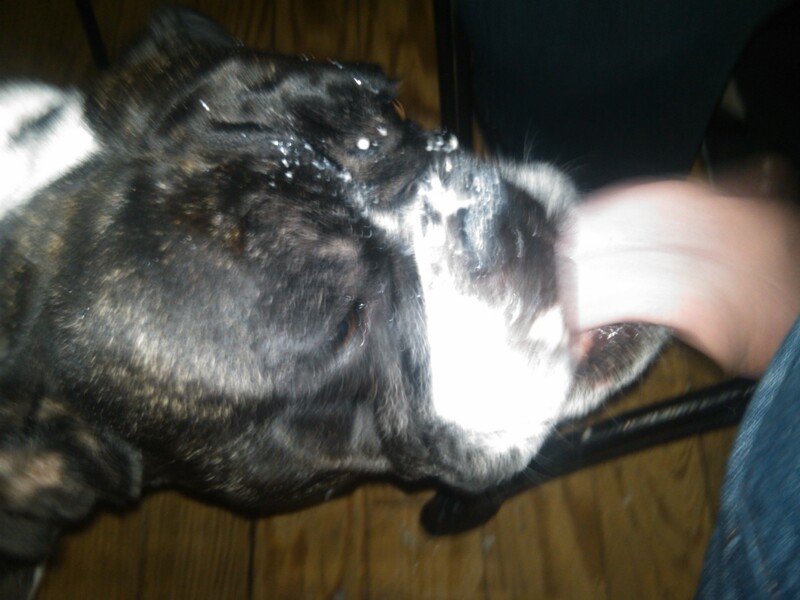 After a few slurps, she looked like someone had upended a bowl of chowder on her head. It was everywhere, but she certainly enjoyed it! After warming our bellies, we headed over to Top Dog, a nearby hot dog shop, to complete our meal. 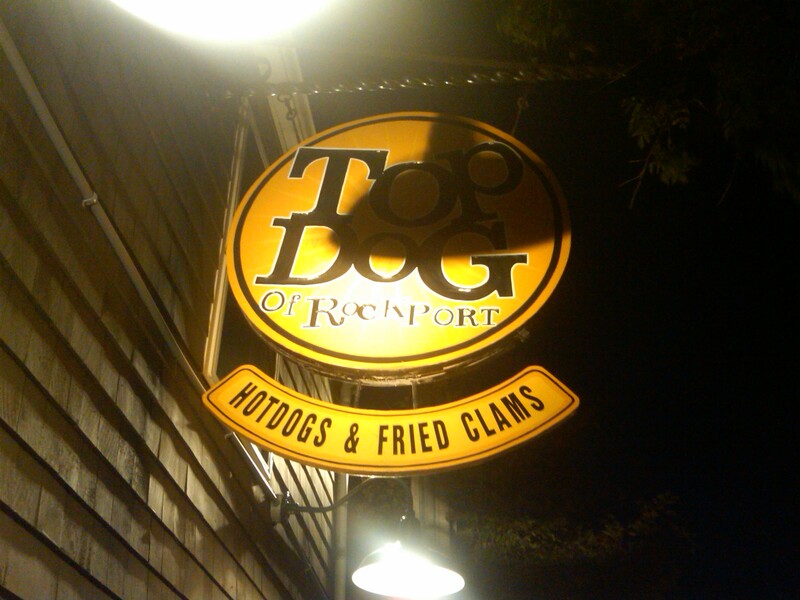 Top Dog, along with Bean & Leaf, is right in the heart of “downtown” Rockport. It’s the central point of town where people come for an evening stroll, a quick bite and some serious people watching. During our short time there, I have already spotted a girl rocking a three-corner hat and the most ridiculously puffy dog I’ve ever seen. Top Dog (surprisingly) has a dog theme. All of their hot dogs are named after types of dogs–although I’m disappointed there’s no bulldog. Come on, guys, the opportunities are endless! 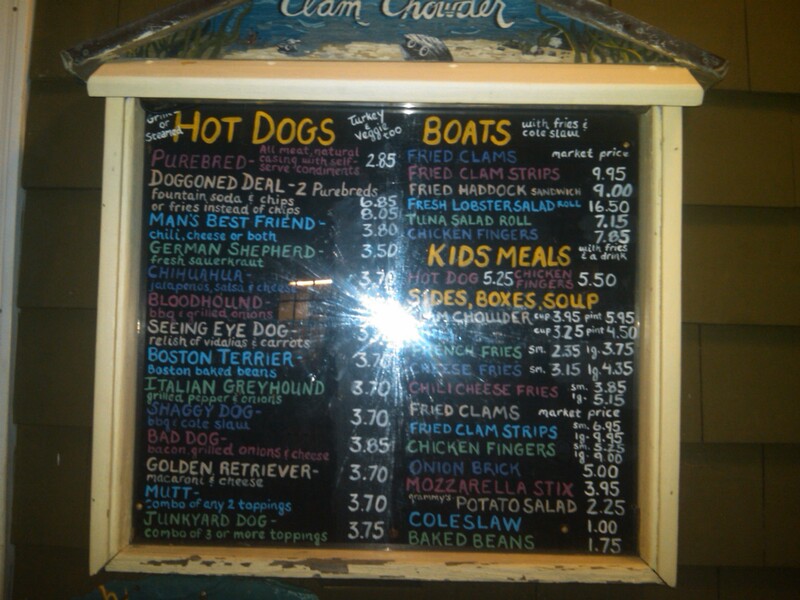 After perusing the outdoor chalkboard menu, my husband and I decided to go with the “man’s best friend” chili cheese dog. 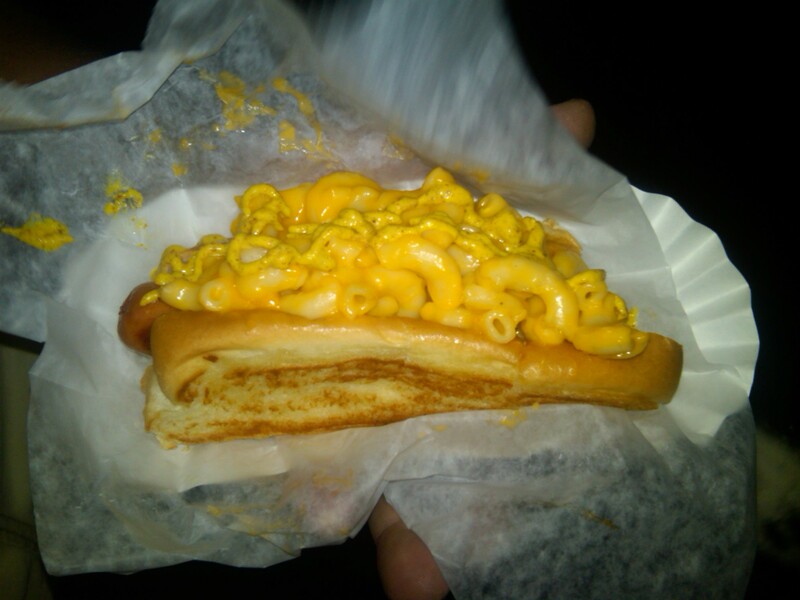 My brother-in-law got the one that was second on my list–the “golden retriever” topped with MACARONI AND CHEESE! Seriously–how could something topped with macaroni and cheese be anything less than fantastic? They also serve their hotdog on the classic New England spit top roll that looks more like a piece of bread than a roll itself. 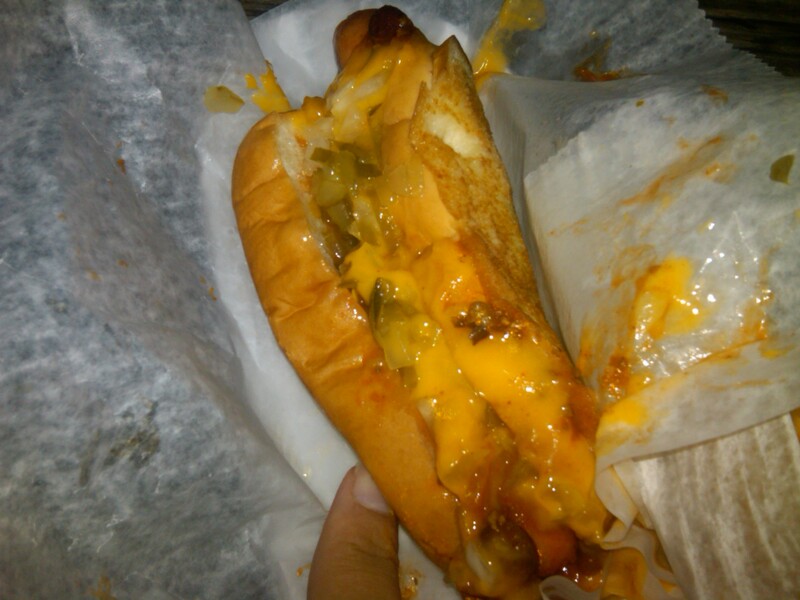 No roll, however, could have helped contain my fabulously messy hot dog. I topped my already heaping hot dog with diced onions and relish. I love fixins. And you can never pronounce it with the “g” at the end (fixings) because it just doesn’t have the same effect as “fixins.” I think Top Dog had 4-5 different types of mustard alone. This is my kind of place. We also went with an order of cheese fries to share. 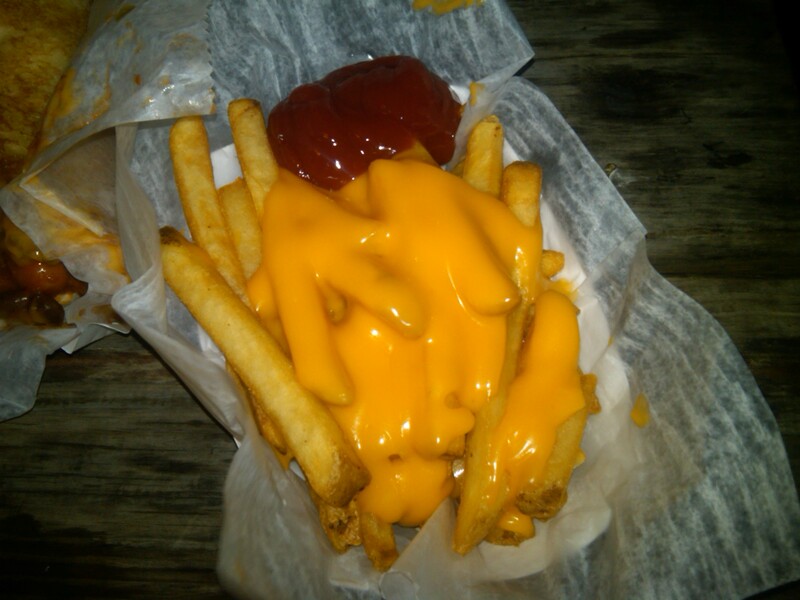 I tend to stay away from cheese fries outside of Philadelphia because they are something of a holy grail to me (please note: Row Home Eats loves anything cheese) but these had some bastardized version of cheez whiz that did the trick. While the fries themselves could have used a little work (twice fried for crispness, please!) the cheez itself was unobjectionable. I forgot to mention that we ate our dogs outside while sitting on (boo, hiss) Boston Red Sox seats. They also had the game on in the restaurant. Apparently there’s some sort of special if the Sox hit a home run or do something good when you’re in the establishment. Luckily we were not privy to the special. No thanks. Meanwhile, Jewels sat outside proudly rocking her Phillies leash and collar set. That’s MY Top Dog. After dinner, we headed over to the ice cream shop for some dessert. By this time I was pretty full, but figured I’d make a little room for something. 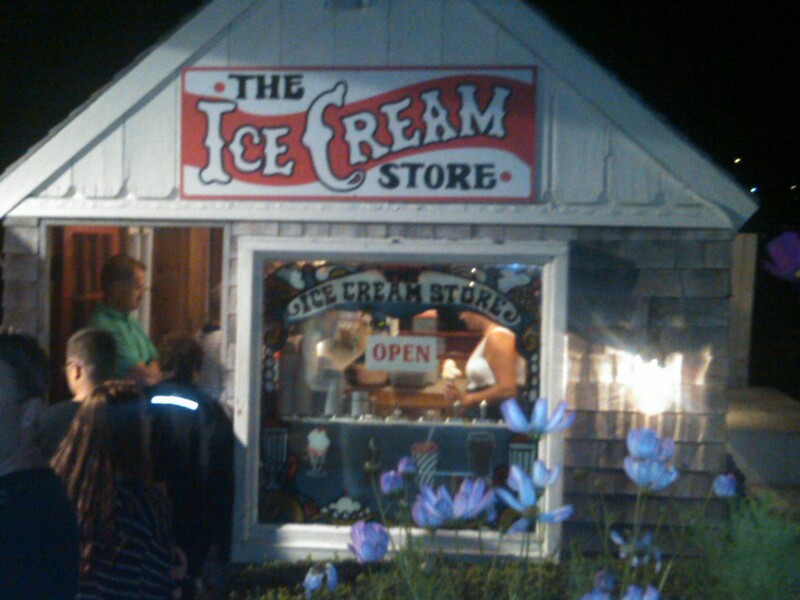 The ice cream shop, located right next to Bean & Leaf, is a cute little shack with a line out the door. I figured it had to be good. I’m still trying to figure out if it actually has a name besides “The Ice Cream Store.” Maybe it’s kind of like The Philadelphia School or Supper Restaurant. Who knows. Anyway, I ended my evening with a whopping serving of chocolate almond frozen yogurt in a waffle cone. It was decent but I’m still on the search to find ice cream better than Hillside Dairy, the little dairy and store just off the Wilkes-Barre exit of the turnpike and on the way to my parents’ vacation home. Next up (hopefully) lobster rolls!